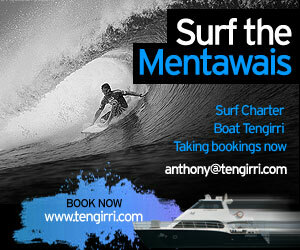 Tengirri is just in from 12 days of sheet glass Mentawai conditions. Combined with a mid size early season swell for the majority of the charter this opened up pretty much every break in the chain. Check out the latest action of April in the Mentawais. The Tengirri Photo Gallery has been updated with some still shots from this charter. 11th April 2019 – 2019 Charters. * 26 Apr – 08 May 2019: 2 spots available – last minute special!! * 08 Jun – 20 Jun 2019: 8 spots available – last minute special!! * 26 Oct – 07 Nov 2019: 3 Booked / 5 spots available. * 09 Nov – 21 Nov 2019: 2 Booked / 6 spots available. * 23 Nov – 05 Dec 2019: 8 spots available. Contact us for our full 2019 charter schedule. Subscribe to the Tengirri fortnightly newsletter by clicking here. Mindless Mentawai conditions on our last charter for the lucky 6 onboard Tengirri. Steaming up to empty lineups with just 6 of your friends on board makes for an enjoyable trip. Check out this short clip of Mindless March Perfection from our last charter and a new photo gallery has just dropped into the Tengirri Photo Gallery. 14th March 2019 – March Madness !!. Rolling into March we had a few puffs of strong wind on our latest charter, blowing us to the more protected corners of the Mentawai chain. Still a quiet time to be in the Mentawai for the luck 7 to be on board. We have uploaded a short clip March Madness.and some crisp new photos have just dropped into the Tengirri Photo Gallery. The first solid swell of the year will be hitting the reefs of Indonesia early next week its shaping up to be another great year in the islands. We have some last minute special spots available on charters departing in the next few weeks. Contact us for more info on the charter dates below. 28th February 2019 – February on Fire!! The late part of February really turned it on in the Mentawais. The old boiz from Newcastle lucked into a great empty season trip. Ten out of ten weather for 12 days always the decision maker on any Mentawai adventure. The whole island chain lit up with a swell which would be more commonly be expected in the middle of the year. Check out all the action of February on Fire ! !and some new still shots from this charter are live now in the Tengirri Photo Gallery . Click here or the logo below for insurance!